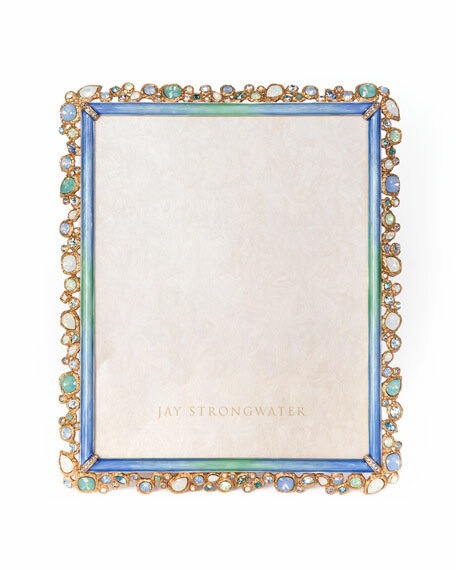 Jay Strongwater Oceana Bejeweled Picture Frame, 8" x 10"
Jay StrongwaterOceana Bejeweled Picture Frame, 8" x 10"
Handcrafted frame hand-enameled and adorned with oversized Swarovski® crystals. Holds 8"W x 10"T photo. Handcrafted frame. 5"W x 6.5"T; holds a 3.5" x 5" photo. Pewter with a 14-kt. matte-gold and light-brown antiqued finish. Handcrafted frame. 5"W x 6.5"T; holds a 3.5" x 5" photo. Pewter with a 14-kt. matte-gold and light-brown antiqued finish. Hand enameled and hand set with Swarovski?? crystals. Imported. Handcrafted classic enameled frame accented by a stone edge. Hand-enameled and set with Swarovski?? crystals. 6.3"W x 6"T. Imported.